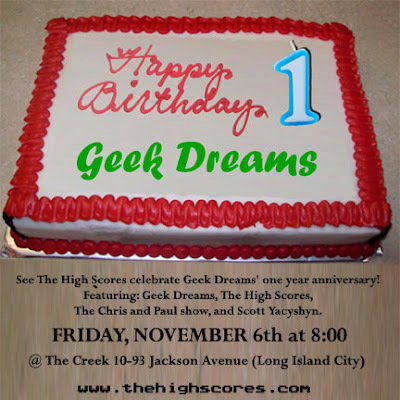 See The High Scores performing with their good friends 'Geek Dreams' as they celebrate their anniversary with a blowout show. A great chance to see a bunch of funny. Featuring: Geek Dreams, The High Scores, The Chris and Paul show, and Scott Yacyshyn. Thanks to everyone who came out to see JACKPOT! last night. Congrats to The Chris & Paul show and thanks to everyone who put on the event. A good time as always, and they do it every month. 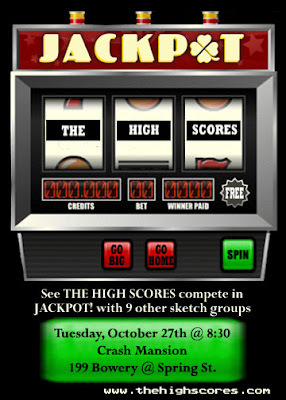 See 'The High Scores' in JACKPOT! Get ready for a very special chance to see The High Scores. We'll be performing in JACKPOT! on Tuesday the 27th with 9 other sketch teams. We'll all do a sketch and there will be a winner - determined by your applause! So cheer hard! Oh, by the way, it's FREE! But donations are accepted at the door, with all the money going to the winner. It's at Crash Mansion - 199 Bowery @ Spring St. - 8:30. Ask for 'The High Scores' table if you want to sit near us. But please don't bother us for autographs.